The complex is situated in the middle of a unique natural park with a total area of 15decares, which is only 100 meters away from the seaside in the most attractive part of Golden Sands resort complex and it offers apartments with a magnificent view to the sea and park. The building complies with the modern conception of luxury and it meets the highest European standards in construction. The complex offers a thoroughly different lifestyle where comfort, security and personal attitude to each one of the guests are inextricably bound up. The region has clean and preserved environment and a climate unique for Bulgaria. The building is ?-shaped, with one underground and seven over-ground floors. The complex offers 106 apartments and 41 studios varying in size from 39.14 to 108.39sq.m. Apartments are to be fully accomplished with a high level of luxuriousness and all security systems. 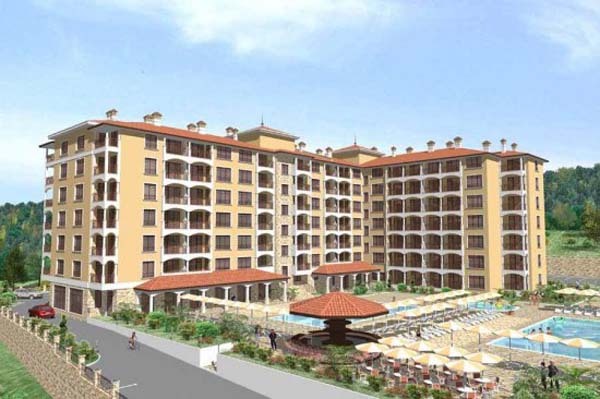 The conveniences offered by the residential complex, its close proximity to the international airport and port, the great number of opportunities for entertainment in the town of Varna, make the complex an ideal place for living and holidaymaking. 2000 EUR reservation fee payable in cash or by bank transfer. •	?/ 1st installment – 30% of the amount with deduction of the reservation fee – within 20 /twenty/ calendar days from the date of payment of the reservation fee upon signing of preliminary agreement for sale-trade of real estate. •	B/ 2nd installment – 30% of the amount by the 30.12.2007. •	C/ 3-rd installment – 40% of the amount upon signing of the Title Deed at the Notary’s office / 06.2008/. •	?/ 1st installment – 60% of the amount with deduction of the reservation fee – within 20 /twenty/ calendar days from the date of payment of the reservation fee upon signing of preliminary agreement for sale-trade of real estate. •	B/ 2nd installment – 40% of the amount upon signing of the Title Deed at the Notary’s office / 06.2008/. •	100% /hundred%/ of the amount upon signing of the preliminary agreement. This listing has been viewed 2328 times.